This Glazed Eggnog Bread is filled with warm holiday spices and makes a deliciously festive treat. Soft, moist and bursting with a subtle hint of eggnog, you’ll love the flavors of this bread that would make a decadent breakfast or dessert! Did you know that grocery stores sell eggnog year round? Or at least for part of the year, when the holidays aren’t in sight? Of course, it’s not on display like it is during the holidays, and I’m sure the sale of eggnog goes waaaay down. But still, I was surprised to see it on store shelves through the year. Same with apple cider. That’s sold year round at my grocery store too, though I never buy it unless it’s fall. It would just “feel” wrong to drink it out of season. Know what I mean? But, back to eggnog. I know a lot of people have different feelings on this drink, but I am a full-on team eggnog lover! 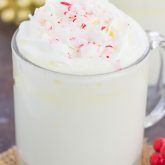 Though I can only drink a few glasses over the course of the holidays, it’s a creamy and seasonal drink that I just have to have come this time of year. But baking? Well, I can consume eggnog in baked goods just about every day of the year. From these White Chocolate Eggnog Cookies, to those Glazed Eggnog Donuts, and this Caramel Eggnog French Toast Bake, eggnog is the name of my game. And that’s where this Glazed Eggnog Bread comes into play. 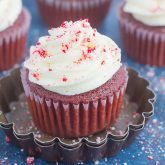 The funny thing about this recipe is that I was testing it over the holidays last year, except in muffin form. And while I finally got the muffin right, I had a hard time with the photography for some reason, so I put it on hold. So when I came to the recipe for this year, I altered it slightly and made it into a bread instead. Whether you could drink eggnog every day, or only like it during the holidays, this bread is perfect for you. The warm and cozy spices pair perfectly with the rich eggnog, creating a flavor combination that is oh-so good. And let’s not forget about that glaze on top! It’s the perfect touch to finish off this Glazed Eggnog Bread. 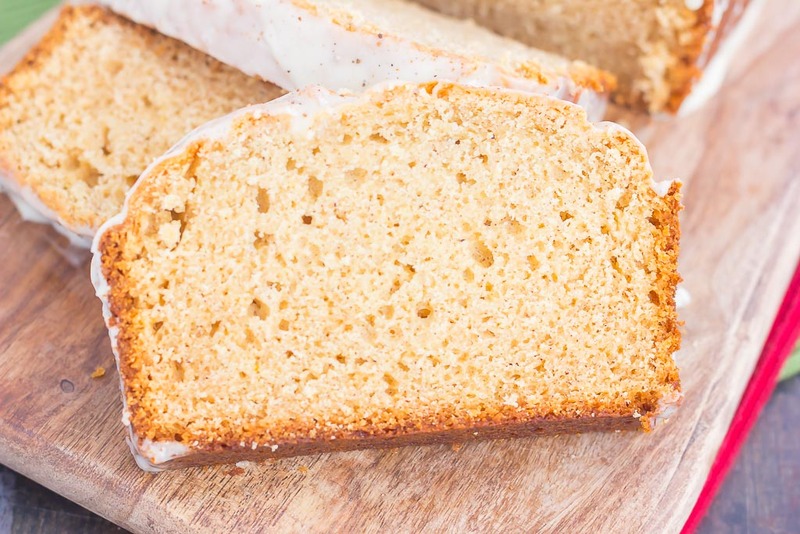 The soft and fluffy center and the sweet eggnog glaze will reel you in on this decadent loaf. 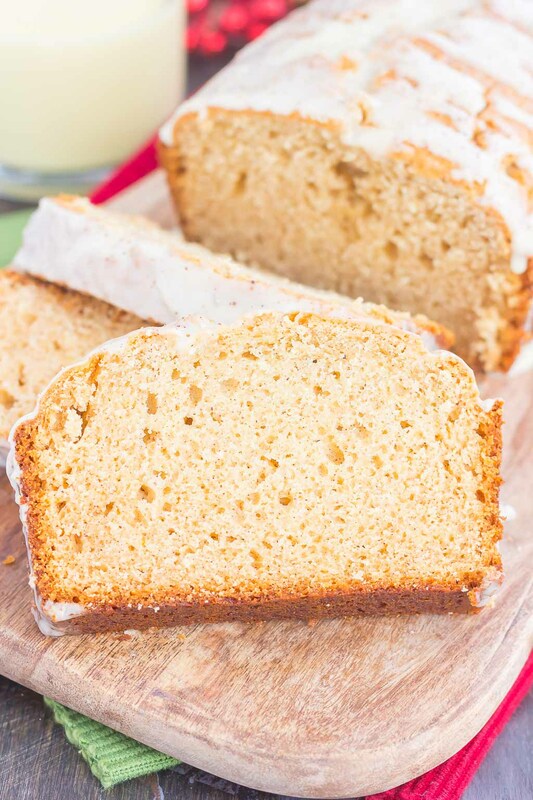 So whether you’re looking for an easy breakfast, afternoon snack, or simple dessert for the holidays, this Glazed Eggnog Bread was made for you. And since you can buy eggnog all year long, you have no excuse not to make these come the spring and summer, too! 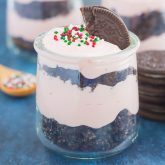 Looking for more holiday desserts? I’ve got you covered! 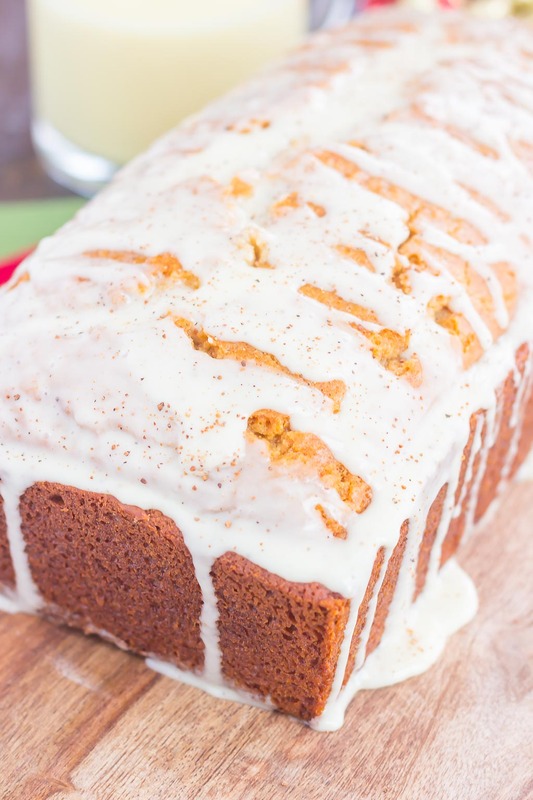 This Glazed Eggnog Bread is filled with warm holiday spices and makes a deliciously festive treat. 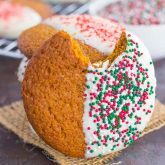 Soft, moist and bursting with a subtle hint of eggnog, you'll love the flavors of this bread that would make a decadent breakfast or dessert! Preheat oven to 350F. Lightly grease a 9x5 inch loaf pan with non-stick cooking spray. Set aside. In a medium bowl, whisk flour, baking powder, cinnamon, nutmeg, and salt. Set aside. In a large bowl, combine eggnog, melted butter, white sugar, brown sugar, eggs, and vanilla extract. Whisk thoroughly. Pour dry ingredients into wet ingredients and stir until just combined, being careful not to over mix. Bake for 48-55 minutes, or until bread is lightly browned and toothpick inserted into center comes out clean. Remove from oven and let cool in pan for 10 minutes, then move to a wire rack to cool completely. To make the glaze, in a small bowl, stir together the powdered sugar, eggnog, vanilla, and nutmeg. It's ALL about the eggnog right now for me! This bread is seriously holiday goals, Gayle. It looks SO moist from the eggnog and that glaze is just stunning! Thanks, Sarah! This bread is a favorite of mine! Unfortunately, our grocery store don't see eggnog year round :( And I love that stuff so much. Though, now that I think about it, maybe that's a good thing, lol. And I guess it's kinda special that I can only get around the holidays! Anywho - loving this bread, girl! And that glaze?!! YES!! So perfect for Christmas morning with a cuppa coffee...or eggnog ;) Pinned! Happy Monday! It is probably a good thing that eggnog isn't year round! Thanks for the sweet comment, Dawn! Eggnog holds a special place in my heart....my dad would make it from scratch every year! I love this bread - it takes me back! I'm sure that's such a great memory, Annie! I don't really drink eggnog but I love it in baking -- it adds so much flavor and makes the texture so soft and fluffy! This bread looks incredible Gayle and I'm glad you got to share this recipe with us this year! Yes! Eggnog is great in baking. Thanks, Marcie! Perfect timing! I have eggnog in my refrigerator right now, and just this weekend I was looking at an old Eggnog Muffin recipe on my blog to try to figure out if I could bake them in a loaf instead. :) I need to try this ASAP! It's so good, Blair! Thanks! THIS BREAD LOOKS AMAZING GAYLE! JUST GOT SOME EGGNOG AND WILL DEFINITELY TRY IT! Thanks, Mira! Hope you like this if you try it! Eggnog in bread?? omg dreams come true!! My grocery store does not sell eggnog year round (SOB! ), but it arrives so early now (I think in early October?) that I can't complain. Eggnog is one of those things I LOVE, but if I had access to it all the time, I'd probably start to hate (similar to candy corn). But seriously, this bread is perfect! I agree, if I drank eggnog more than just around the holidays, it wouldn't be as special. Thanks for the bread love, Sues! So I will admit that I do not like drinking eggnog (like at all), but I LOVE to bake with it! 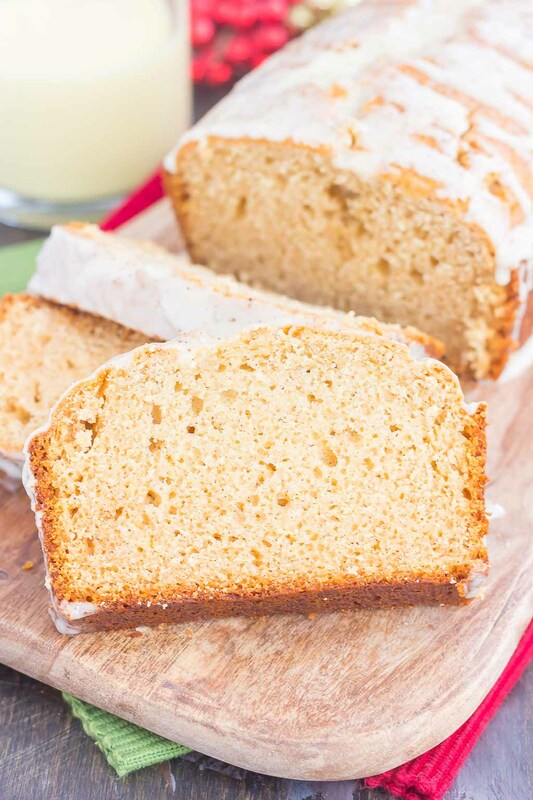 And this eggnog bread sounds just perfect! Especially with that glaze! Eggnog in baking is so good! Thanks, Ashley! Hi Karina! I'm so happy that you like this bread! And that's a great idea to freeze eggnog...I'm going to remember that for when it comes out again! :) Thanks so much for stopping by and letting me know how it turned out! Hi Rebecca! I have never frozen this bread, so I can't say for sure. Hope you like this if you try it!